Yes, people really said those things to me. I swear. And, that was just from my family. My youngest daughter is very prone to sore throats and she used to get an annual case of strep throat. We know this. We’ve known this for years. So, you would think that we would just prevent it from happening, right? Well, for several years, we did. Things were running along quite nicely. Then, I made the mistake of loosening the apron strings. The result was three teenage children who don’t take the preventative measures they should. Go figure. Don’t blame me! Every December, I make up a fresh batch of Immune Boost Extract and a bottle of Immune Boost capsules. I keep a jar of raw, locally-produced honey and a fruit bowl full of lemons on my counter. Our neti pot sits in the bathroom cabinet, right next to a small vial that holds a mixture of golden seal and sea salt. I have instructions with everything and I’ve shown each of my children how to mix everything up. Now, I know, trusting my children to actually do it may, at first glance, seem like a moronic thing to do. After all, they are teenagers. Honestly, though, we’ve been doing this for eons! I’ve seen them do it. I know they know how. What I underestimated was their actual desire to do it. So, when strep-throat season rolled around in January, there all of those preventative measures sat, looking lovely on my shelf, untouched. And, when my daughter came and said her throat hurt, I looked at those bottles and jars. Then, I looked at my daughter and sighed as I pulled out the penlight and shone it on the lovely mass of white blisters coating her tonsils and tongue. Now, as a rule, strep throat will usually run its course and disappear on its own. There is no debating that, as far as I am aware. However, doctors still hand you a prescription a for an antibiotic and tell you just ride it out. We’ve been on that merry-go-round. In fact, we were on it so long we started to get motion sickness. So, we started treating it naturally. Extra doses of immune-strengthening tonics several times a day, limited diet to exclude anything dairy (I’ll explain that one in a minute) or white-flour based. We don’t try to fight the fever. After about 24 hours, as expected, her fever broke, her symptoms lessened and she was tolerating the recovery process pretty well. After 72 hours, she was feeling great. We kept her home from school all week, just to be sure. I, feeling rather proud of myself, put the ordeal behind us and moved on the next item on my to-do list. Sure enough, the blisters are back. The fever is back. Plus, she has this really weird red patch on her knee that hurts. I didn’t really think much about it, seeing as how my daughters are kinda like me…allergic to everything, and I was far more concerned with the reappearance of the strep throat. Craptastic in a gift box! Back to square one. She took a shot of the Immune elixer concoction and went to bed. The next morning, I awoke to her shrieks of horror. She had spots. Lots of spots. They were all over her side and legs. A quick bit of research and a few phone calls and I was reasonably certain of what was going on. 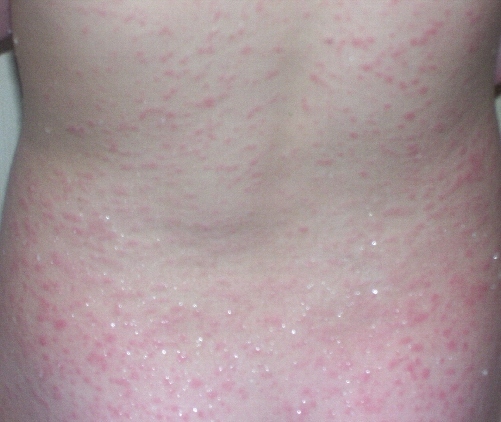 My daughter had Scarlet Fever. I’m gonna admit this, but I might deny it if you ask me later…I thought about taking my daughter to the emergency room. I know, right? But, I remained calm. I asked a few medical professionals that I know what would happen if I took her in as far as treatment. The unanimous answer was 1) internal antibiotics 2)external antibiotic cream. Scarlet Fever, like strep throat, will disappear on it’s own in about a week. 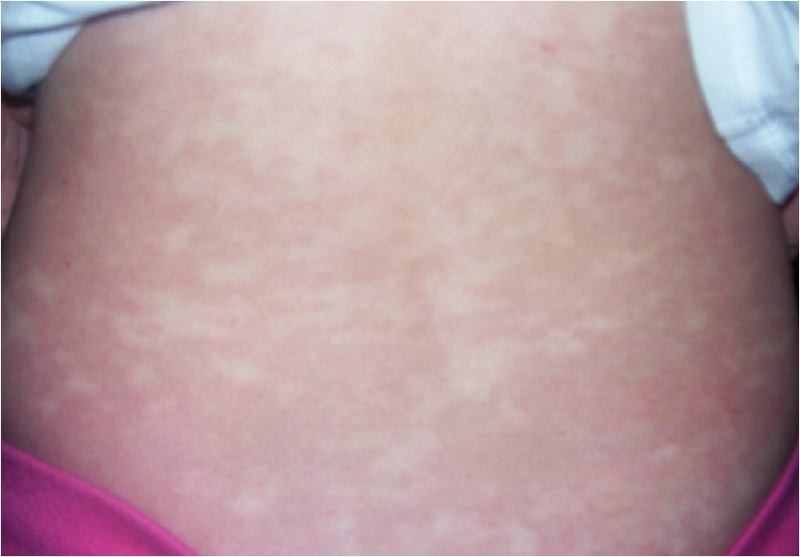 The spots may hang out for a bit longer, and the resultant peeling may last up to a few weeks. Also, expect a little scarring. So, I had a decision to make. Do I take the information I’ve spent half my life gathering and put it to the test again, or do I take my daughter to the ER? Well, of course you know what I chose. Otherwise, what would be the point of this whole long, drawn-out story? What I did was to set my daughter down and explain to her what was going on. I told her what I believed she had and what she could expect to happen. I relayed to her all of the information I had gathered, including what the medical community had told me. I gave her all of her options. Lest you think this was irresponsible of me, let me explain. My youngest daughter is fourteen. She, like all of my children, has spent her entire life immersed in this lifestyle that I have chosen. They know why I feel the way I do about Western Medicine, and they know why I have such a strong faith in Alternative Medicine. They think that sometimes I go overboard with the whole ‘natural’ thing ~ you know, like making my own shampoo and soap ~ but they understand it, too. They ask questions. We have real, intelligent discussions. They know the statistics. Now that they have reached an age where they are able to rationalize and problem-solve with less help from me, I feel that they deserve to be able to have a say in any decisions that will personally affect them, including their choice of health care. This situation was no exception. My daughter considered all of the alternatives and took an hour or so to sort through them. She decided that she wanted to treat it naturally if possible, but she reserved the right to change her mind. Smart kid, huh? Then, we laid out a plan. Heavy use of the Immune-Boost/lemon/honey. A blend of herbs to help cleanse her body thoroughly while providing it with some of the vitamins and minerals it would need to heal quickly. Her diet was restricted to nothing but raw or lightly steamed veggies, distilled water, herbal tea, fresh fruit juice and whole grain rice. The purpose of this was two-fold. Processed foods, dairy and meat are known to cause a mucus build-up in the body. Bacteria and other nasties love this mucus and they entrench themselves in it, where they grow and multiply. Group A streptococcus bacteria, which is the bacteria that causes both strep throat and Scarlet Fever, has been closely associated with the use of dairy products. Plus, the fresh fruits and veggies would ensure that she was still receiving plenty of the nutrients her body would need to heal quickly, and they would help to cleanse her system of any toxins that had accumulated in her digestive tract. She took a bath 3 times per day using a blend of salt, herbs and oils that are known to help detoxify the body. This was followed by a vinegar/distilled water rinse to remove all the toxins from the skin. The added benefit was that the oils and herbs helped to protect the skin from the damage caused by the toxins being released. Three tablespoons per day of our Herbal Honey Soothing Syrup with a pinch of cayenne and three garlic cloves. It was an aggressive approach and she knew that things could get worse before they got better, but we were ready. She was mildly itchy, but she said it wasn’t unbearable or painful. When it got to be too much, she would head back to the tub. 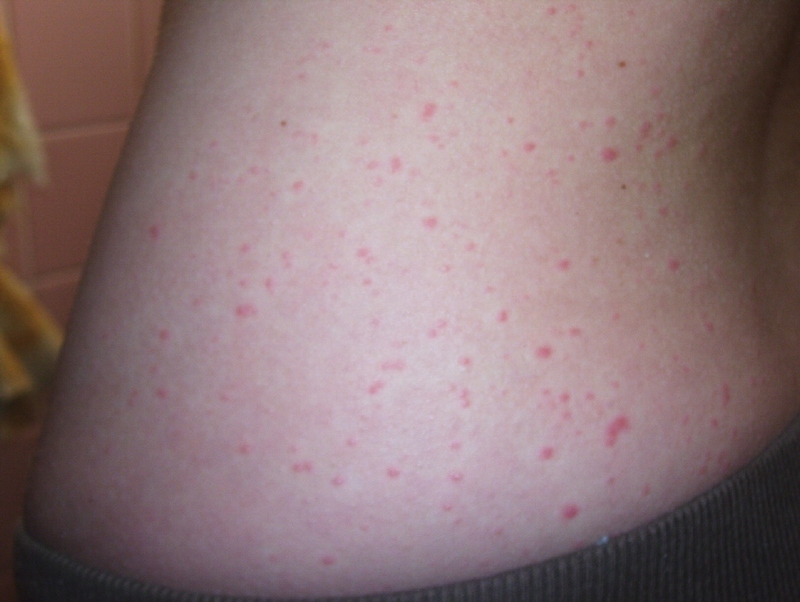 Over the next 24 hours, the rash got continually worse, eventually covering her from head to toe. Literally. We were expecting the rash to turn dry and scaly, since that is what we had been told and what we had read that we should expect. It never happened. We kept expecting her skin to start peeling, but that never happened, either. I took a deep sigh of relief. Whatever we were doing was working! She didn’t itch at all anymore, the blisters on her tonsils and tongue were shrinking and disappearing, there was no fever and she was feeling great. With the worst past, I got to wondering why she had developed such a nasty thing in the first place. After all, she had been taking the Immune extract. Yeah. Sure she had. That’s another story. I was concerned that she would grow lazy with our plan now that she was healing up, though. To my eternal pride, she didn’t. She stuck to it faithfully for the entire week that we had originally planned. By then, the rash was completely gone. There is nothing left behind to let anyone ever know that it had been there in there in the first place.